Aikatsu Friends! – 048 | Mezashite! Wait!! Could those be the legendary…!!! There are some real treats this week, and I’m not just talking about a great and touching episode, or even about the extra sugar content. 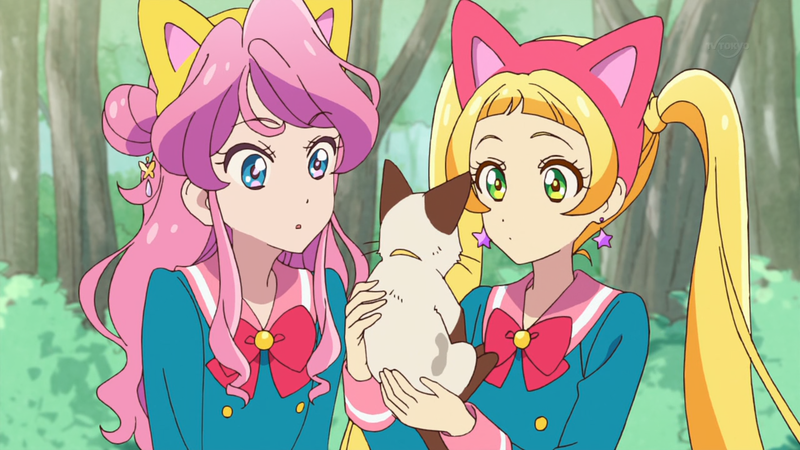 Well this was probably the first episode sense this started that I felt for the honey cats girls at the end. So money does exist in Aikatsu country. That makes me wonder why we never see idols doing any kind of charity work. You’d think that would be right up their credo. we get hints of money and production from time to time but they don’t really go too into detail about. How ironic that it was a flock of crows which led Honey Cat into securing a financial backer via cat grooming service, because crows are usually meant to symbolize bad luck. Honey Cat episodes are seriously the best. God bless this show. Also, that preview?! What a bomb drop! “Cool dudes don’t look at explosions” kind of hype right at the very end. Can’t wait for next week.